Going the extra mile: 9 miles in fact! In a busy world gratitude goes such a long way. We recently had a visit from Nigel Savel; founder of the 9 Miles Project, to present us with a token of thanks for the help we have given them. What Hot Ink has done for them in the form of print sponsorship seems so small in comparison to the massive challenges he faces and has to overcome daily, and yet he had driven all the way to say thank you and share his time with us – humbling to say the least. What started as a side project in 2015, grew into something that required full-time focus. 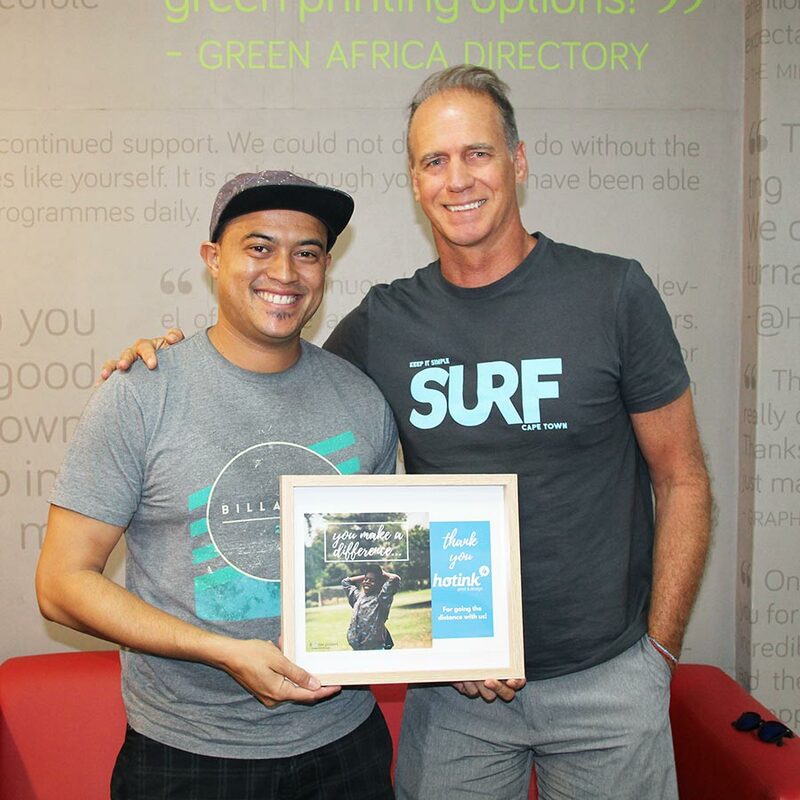 Nigel; and eventually his wife too, gave up their day jobs and committed themselves to this non profit organisation that is changing the lives of so many at-risk youth, using surfing as a medium. It was fascinating to hear his analogies between surfing and daily life: “Peoples attitudes start to change when they overcome challenges. A kid who finally manages to paddle out through the shore break and make it to the backline for the first time, starts to see that anything is possible and perseverance pays. But they need constant help to stay motivated as many of them have little or no home support”. Sometimes we feel overwhelmed when we think of all the vulnerable people in our country that need help, but thanks to people like Nigel and Sher’Neil who have created successful entities for change to which we can all contribute in our own small way, we can collectively make a difference. And when they make the effort to thank you in person, it makes it even more worthwhile.